Shoulder augmentation is a procedure requested by men who want to widen their shoulder width. This can be done by either fat injection grafting, deltoid implants or clavicular bone lengthening. Each method has their advantages and disadvantages. Fat injections are minimal surgery but their volume persistence is unpredictable. Conversely clavicular lengthening is the most invasive, requiring a bony osteotomy, plate fixation and an interpositional bone graft. Deltoid implants are intermediate in invasiveness and provide an assured increase in shoulder volume. But there are no standard deltoid implants and they do require a surgical incision to place. Both are surmountable issues but are critical to achieve an aesthetically pleasing result. While the deltoid muscle anatomically has three heads, it does not seem to make much sense in placing three separate implants. 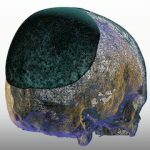 A single piece implant that covers all three heads provides the best aesthetic result. Whether it is more oval around its superior portion or slightly more square is an aesthetic choice. Most thicknesses of the implant do not need to be more than 10 to 15mms at its superior portion. The implant should be composed of a solid but ultrasoft silicone material for a more natural feel and ease of insertion. The key to placing deltoid implants is that its upper edge needs to be as high as possible to ensure a maximal widening effect. In that effort, the single incision used for its placement needs to be superiorly placed. 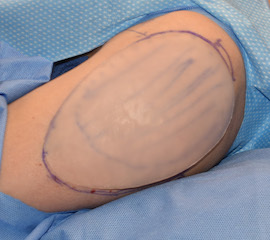 Trying to completely hide the scar, through a posterior axillary incision for example, makes the subfascial pocket dissection vey difficult to do around a curved surface. 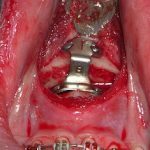 In addition should the implant pocket end up too low there is no way to subsequently raise or adjust it. 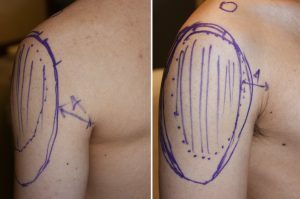 Thus I prefer a small 3 cm incision placed in the midline of the upper deltoid skin crease where the shoulder becomes horizontal or at the superolateral (10:00 position on right side or 2:00 position on left side) position. 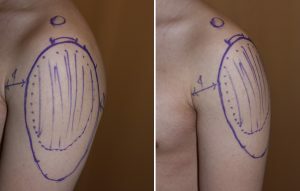 Deltoid implant placement is subfascial. Because the muscle is not a gliding one like the calf or biceps/triceps, subfascial dissection is much more difficult due to the adhesion of the fascia to the muscle. Infiltrating the fascia with local anesthetic or even a Hunstad solution prior to dissection is helpful to cut own bleeding with the subfascial dissection.